Join us on June 15 from 5-8 pm for JWN Annual Picnic Potluck and Charnel Mulligan Park Grand Opening! Mayor Vinis will be cutting the ribbon, the One More Time Marching Band will play, Cornucopia will grill, and there may even be a parade! 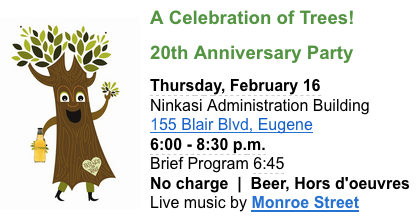 Friends of Trees Eugene Anniversary Party!